Interested in Policy and Inclusive Higher Education? 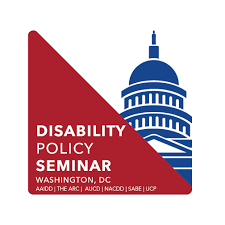 The Association of University Centers on Disability (AUCD) and Think College are supporting the development of a new cadre of policy advocates through this new scholarship that will support teams to attend the 2019 Disability Policy Seminar in Washington, DC (https://disabilitypolicyseminar.org). If you or someone you know works for or attends a postsecondary education program for students with intellectual disability, you are qualified to apply! Five teams, comprised of one student and one staff member, will be selected. Teams must be interested in learning more about public policy and be able to commit to a series of activities over a year. The team members do NOT need to be from the same college or university. The five teams that are selected will receive conference registration and travel expenses (up to $750) to attend the Disability Policy Seminar in April 2019. Participants will learn about policy and advocacy at the Disability Policy Summit and will participate in visits to Capitol Hill to talk with members of Congress and their staff. Additionally, they will be responsible for subscribing to the AUCD news updates, host a policymaker at their IPSE program, create some policy documents to share with policymakers, host a Think College Public Policy Affinity Group call, and produce some other written pieces. All details can be found in this Think College Policy Advocates description. All interested parties should complete the application and provide supporting documents for submission by December 21. Any questions, please email Denise Rozell at AUCD.